With today's trend toward oversized baths and luxurious home spas, being stuck with a small bathroom is a challenge, to be sure. It can be awfully tempting to downplay the decorating scheme for a modestly proportioned bath, in hopes that no one will notice just how cramped the quarters really are. But that has a tendency to get very boring, very fast. 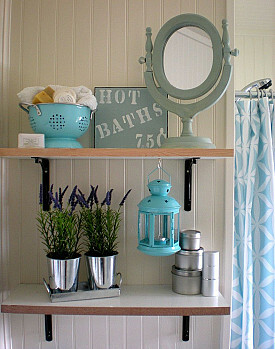 Instead, why not take inspiration from these unashamedly stylish DIY small bath remodels, courtesy of Hometalk? There's something about beachy style that is just so relaxing. Its muted color scheme and casual air will give your restroom the atmosphere of a seaside retreat. DesignDreams by Annie used soft shades of aqua and sage, together with some tres cool accessories, to make a big, bright transformation of a pint-sized bath. Who says rich color will be too dark for a limited space? Nobody -- if you add it as an elegant accent note, that is. Kristi@addicted2decorating painted the upper portion of her bathroom's walls a deep teal to contrast with the white subway tiles below. Interestingly, the effect is a lot less overwhelming than the tiny-print wallpaper that it replaced. It all started in the living rooms of our nation. Now beadboard paneling is riding a tremendous wave of popularity for every room in the house. 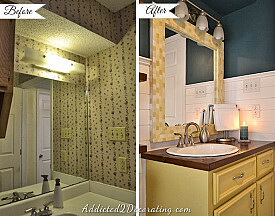 Here Marty's Musings used white beadboard to adorn the walls of an undersized bath. Stretching to the ceiling, it draws the eye upward and visually enlarges the space. In addition to its obvious purpose, a bathroom is where you make yourself look (even more) beautiful. So why shouldn't your surroundings reflect this goal? 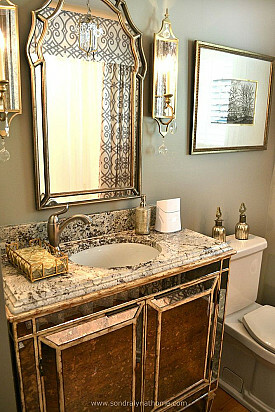 Sondra Lyn at Home came up with a super glamorous yet petite and practical look using a stunning chest-turned-vanity, a vertical mirror, and … tada! … even a chandelier. Grouping eclectic items is an ideal way to show them off … and to bestow larger-than-life personality on a pocket powder room. Organized Clutter proves beyond a doubt that the whole is much greater than the sum of its parts with her sub-compact 3/4 bath, attractively and inexpensively decorated with fun vintage objects. 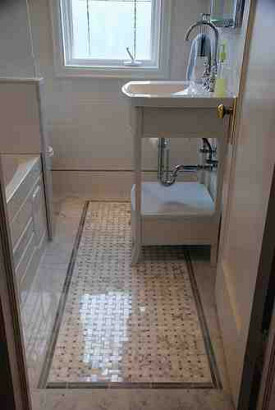 Hard-to-clean wall-to-wall carpet has gone the way of the dodo, as far as contemporary bathrooms are concerned. A tiled floor "rug," on the other hand, is the kind of opulent (yet easy-care) touch we're seeing a lot of in big beautiful baths these days. Ramblingreno scaled hers down to fit perfectly into a scanty square footage. 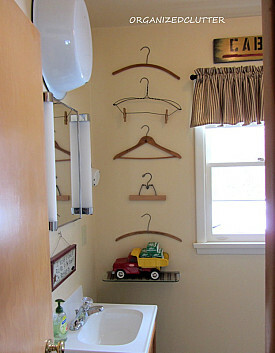 Nothing says "with-it washroom" like streamlined open shelving. Just don't tell anybody the real reason why it's there. 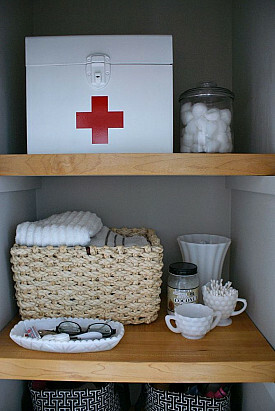 Urban Acreage removed the linen closet door from her minuscule bath simply because it kept getting in everyone's way. And voila! 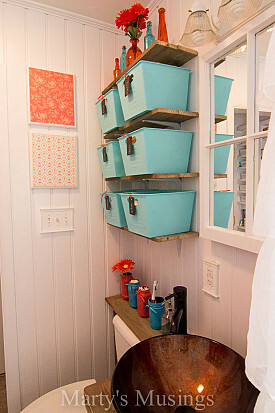 She ended up creating trendy storage style for all her bathroom essentials.